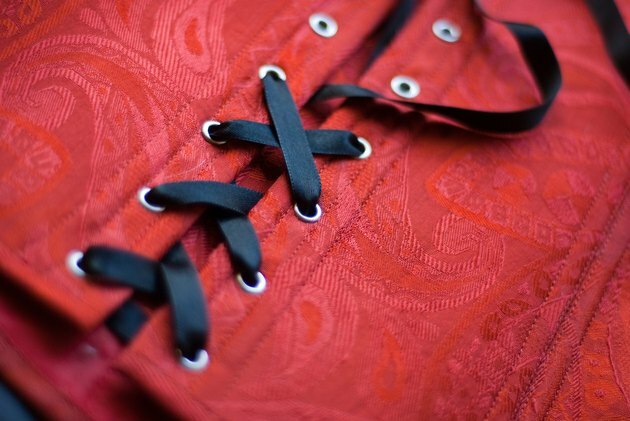 Can You Wear a Corset to Lose Your Belly? Celebrities, including Kylie Jenner and Kim Kardashian, purportedly wear corsets to help them slim down. This process supposedly "trains" your waist to a smaller size. However, corsets only make you appear thinner when you’re wearing them – they do nothing to burn off belly fat. To truly lose your belly, adopt a healthy, reduced-calorie eating plan and increase physical activity. Waist-training corset manufacturers recommend you wear the corset for hours at a time during the day. While you may sweat a little extra and lose a few ounces of water weight as a result, wearing the corset can't cause you to lose fat. Fat is only lost when your energy expenditure exceeds your energy intake so you consume fewer calories than you burn. When your body senses such a deficit, it releases the triglycerides stored in fat cells, which the body transforms into usable energy. As a result, you lose weight. A corset does nothing to contribute to a calorie deficit -- it has no effect on your energy expenditure or caloric intake. When people do lose weight while wearing a corset, it's only because they've trimmed their calorie intake. The corset is so uncomfortable that it discourages you from eating. While putting on a tight-fitting garment might seem like a plausible way to stop mindless eating, it could actually have serious health ramifications. It can constrict your breathing muscles and cause shortness of breath. Pull the corset too tightly, and you may develop bruising or rib pain. If you suffer from digestive disorders, such as irritable bowel syndrome, the corset could aggravate your condition by contributing to abdominal pressure. An uncomfortable garment is not the magic bullet you need to lose excess belly fat. Reduce your belly by making changes to your eating habits. Eliminate extra calories, especially from refined grains, sugars and saturated fats. These include snack foods, sugary sweets, soda, white bread, fatty cuts of meat and full-fat dairy. Instead, fill your plate with healthy, whole-food options such as lean meats and poultry, fish, fresh produce and whole grains. Use an online calculator to determine how many calories you burn daily, and then create a 250- to 1,000-calorie deficit from that number to determine how many you should eat daily to lose between 1/2 and 2 pounds per week. Do not trim your daily intake to below 1,200 calories for women or 1,800 for men, or you'll risk slowing your metabolism, losing muscle mass and potentially missing out on important nutrients. A physically active lifestyle combats belly fat, but wearing a tight-fitting, breath-constricting corset makes extra movement uncomfortable. Seek ways to burn more calories through movement. This might be as simple as parking farther away from your destination, taking the stairs instead of the elevator and pacing while you talk on the phone. Adding a formal exercise routine is also effective. At least 250 minutes per week of moderate-intensity cardio, which includes brisk walking and water aerobics, is necessary to lose significant weight. Total-body strength-training helps build lean muscle mass as you drop pounds, which will make you look leaner and healthier as well as feel stronger and more functional. Does Working My Abs Reduce Stomach Fat?